The long-waited Android-powered Nokia smartphone will be "tailored in a way that won't promote some of the key Google-developed features that a more traditional Android-powered phone might", according to sources cited by the WSJ. Basically, the Nokia devices will not be compatible with the Google Play store and a number of applications. Although it appears that this is good news for Android fans, it must be noted that this Android-powered smartphone from Nokia will be specially tailored so that a number of Google features will be not be heavily promoted. The device will feature apps from Microsoft and Nokia like the Here map service and Mix Radio instead of the Google apps like Maps and Gmail. Nokia will also have its own app store with its own Android apps. In the past, it has been reported that Nokia was working on this Android fork back when Microsoft was still preparing to make an offer. Microsoft has been said to have a couple of reasons for using Android along with the Windows Phone OS, which includes the need to use Nokia's manufacturing power and to offset some of the high costs of running a mobile division.According to the WSJ, another reason is the fact that Windows Phone cannot pull off to run on low-end devices which forces Microsoft to be pragmatic and utilise software made by its competitor for its mid-range and entry-level smartphones. In the past weeks, reports revealed an almost complete image of the Nokia Android-powered smartphone codenamed Normandy. The reported device sports entry-level specifications and a design that mimics the Asha line. 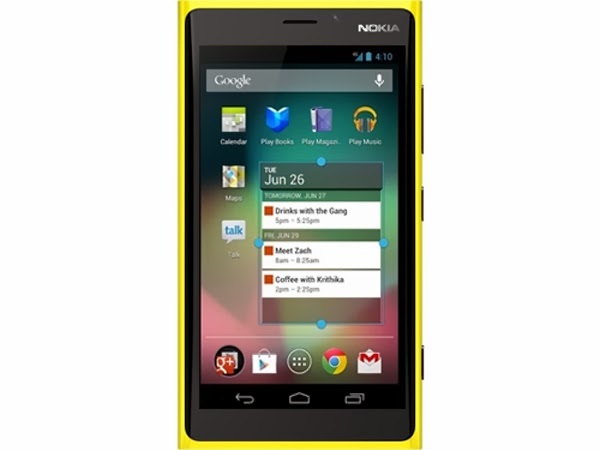 On the software front, the Nokia's UI is created as a hybrid between Windows Phone and Android.